4.1 What is likely to be the cheapest way home at short notice? 1.1 Participating national association tickets. What about the other 2,000 tickets referred to in press releases? It appears that the FAI have been provided with 2,000 tickets for each game, in addition to the tickets outlined above. The FAI have clarified that “For each Participating National Association at EURO 2016 a total of 2,000 tickets have been awarded by UEFA. The FAI intends to distribute these tickets, once the ticketing process is complete, to unsuccessful applicants with a proven match attendance track record, and to the ‘Football Family'”. The initial application procedure from UEFA will not be finalised until rejection emails are sent, on or before the 29th February. From figures provided by the English FA to their fans, it appears that the figure of 2,000 tickets is per game, rather than 2,000 total. The distribution process for these tickets has not been completed; however, the time for applying has closed. While the FAI have not, as of the end of March, got back to people in relation to these tickets, it is anticipated this should happen soon. When does the resale portal open and how will it work? The resale portal has now closed. In 2012, the portal was open until April, then closed, but re-opened in May. The reason for the closure was to enable all tickets to be posted out. Tickets ordered after the portal re-opened in May had to be collected in person in Poland. It is anticipated a similar procedure may apply here, although it is not yet clear. As it stands, by visiting the UEFA website (here), you may enter the portal and express interest in tickets which may become available. What tickets might be available now that the portal has closed? It is not yet clear exactly what tickets will be made available, or how many there will be. It is likely these tickets will be sponsor returns, returns from other associations and similar tickets. How likely am I to get tickets? The answer to this is far from clear. It would appear that the “last minute” sales platform will operate on a first come, first served basis, going on the UEFA FAQs, available here. Is there anything I can do to increase my chances? There are two solutions. The first is to spend a large amount of time on the portal continually pressing F5 to refresh the page and then selecting tickets the very second they come up. However, you could still miss out doing this. The second is to use an automated script. These may be available by pming posters on the tickets thread. I do not have access to a script. Links to each individual match ticket page are available here for Sweden, Belgium and Italy. It appears it may be better to refresh these pages individually rather than the home page. All tickets will be sent by UEFA in May, by registered delivery. If it is not possible for UEFA to deliver the tickets, they will be returned to UEFA and will then require collection in France. Tickets ordered on the portal after May could have to be collected in France. Similarly, it appears a small percentage of tickets from earlier portals may also have to be collected in France. Update: As of early April, it appears tickets have been delivered to both Welsh and Polish fans, and possibly other fans. They have been sent by DPD in Wales so will presumably be sent with a similar company here. Emails will be sent by UEFA advising when tickets have been sent and should include an ability to track the order. Can I use a debit card to pay for tickets? The UEFA website says credit cards only can be used. HOWEVER, since the close of applications on the PNA portal, they have confirmed that debit cards can be used and will be accepted. It appears debit cards are accepted. Will I need ID to enter the stadium? It is not clear how many IDs will be checked prior to entering the stadium. Obviously, security is likely to be higher at this tournament than it was in 2012. This may result in increased ticket checks. It is more likely, however, that there will simply be increased checks on bags, jackets, personal belongings etc than there will checks on tickets and IDs. 1.4 Where in the stadium are my tickets? How do I find out where my tickets are? If you log onto the UEFA portal (here) and click on the “my tickets” section, it will give you section numbers, row numbers and seat numbers for each ticket allocated, hopefully including PNA and resale portal tickets. 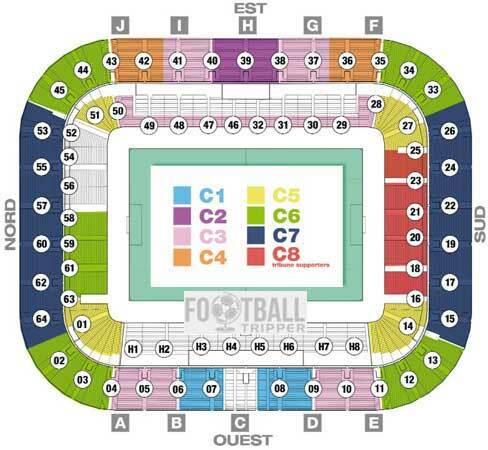 For the Stade de France, use this link and input your section number to see a view from your seat. However, if your section number contains a zero (e.g. L05), omit the zero (e.g. L5). A seat plan graphic is available here. For Bordeaux, a seat plan graphic is available here. The official stadium website seat finder is here. For Lille, a seat plan graphic is available here. The official stadium website seat finder is here. What about knockout round tickets? Ticket seat numbers have not yet been allocated for knockout round tickets. However, seat plans for most stadiums are readily available on google image search. How can I book travel from the Netherlands and Belgium to France? There are two main options for booking travel to France on public transport. The first is by train: these are currently available on https://www.thalys.com. These tickets are limited quota: that is, as cheaper tickets sell out, the train will get more expensive, until it sells out. There are fast, frequent trains from Amsterdam and Brussels direct to Paris. In respect of travel to Lille from Belgium and the Netherlands, it may also be possible to book TGV tickets from Brussels to Lille, via http://en.voyages-sncf.com/en/, https://www.captaintrain.com/ orhttp://www.loco2.com (this last site will charge sterling prices). These sites all sell official tickets at official prices, albeit loco2 does charge in sterling as opposed to euro. However, there are some Thalys trains and Eurostar trains which run to and from Lille, so it may be worth checking out all three options, if you are travelling on this route, to determine the cheapest tickets. The Thalys and Eurostar tickets are also on sale already. Journey time for the train is about three hours twenty minutes from Amsterdam to Paris and about one hour twenty minutes from Brussels to Paris. The second option for getting to France is by bus. http://www.ouibus.com/ run frequent and cheap buses from the Netherlands and Belgium to both Lille and Paris. They also operate a network of services around France and to and from the UK. Ouibus are a subsidiary of French national train operator SNCF. Tickets on Ouibus are likely to be significantly cheaper than tickets on Thalys or other trains; however, transport is likely to be significantly slower, given that all Thalys trains to France and most TGV trains in France run at least part of the journey on high speed tracks, in excess of 250km/h, more than twice the speed of the bus. For those on a budget, the Ouibus does provide an alternative. It should also be noted that the Ouibus fleet is equipped with wifi, and that access is free, whereas this is not the case with Thalys, where wifi access must be paid for if the cheapest second class tickets are purchased. Ouibus from Amsterdam to Paris is likely to take about eight hours and cost €19. From Brussels, journey time is under four hours and prices start at €15. Further, lads off the forum are running buses direct from Amsterdam to Paris on the 12th June. These buses may be cheaper than the current cost of train. However, it should be noted that the journey time from Amsterdam to Paris is likely to take approximately six hours on this bus, if not longer, and the train is obviously a lot quicker. Please contact them directly on euro2016buses@gmail.com for further information on prices and times. Payment can be made by bank transfer or paypal. Their bus organisational skills are excellent and they come highly recommended, in terms of speed, comfort, facilities, price and craic. There are now also new low cost trains from Brussels to Paris, with IZY, a subsidiary of Thalys. These are around an hour slower than the normal Thalys trains, as they run on the old line from Lille to Paris, rather than the high speed line. Tickets for this train are liable to be much cheaper. They sell some standing tickets and some tickets for fold down seats. It should be noted, however, that even if you only buy a standing ticket, there may still be seats available, if the train is not sold out. They do *not* stop in Lille, running direct from Paris to Brussels and back, so they are really only an option for the first game. There is only one IZY train on the 13th June which will arrive in time in Paris, leaving Brussels at 10:28 and arriving in Paris at 12:50. Ticket prices start at €10 without a guaranteed seat, €15 with a fold down seat, and €19 for a guaranteed proper seat. However, tickets for these trains have not yet gone on sale. You should regularly check the website to see if they have. How can I get to Lille from airports in Belgium? From Charleroi, it will take approximately 1h40m on local trains. Trains are hourly, €23.40, take 1h40m, and require one change, in Tournai, with seven minutes to change. From Brussels to Lille, the Ouibus referred to above may be a good option, as it is less than two hours (although only 30 minutes on the fastest trains). There are multiple slower train options taking approximately 2 hours, costing €23.40, generally with one change. The faster trains are generally priced around €30. You can check times and prices on https://www.b-europe.com/Travel. However, for the local trains, there are no advance ticket discounts, and it may be as handy to buy tickets in person in Belgium. Also, to and from Charleroi, Flibco buses may make the most sense. Check times and prices at https://www.flibco.com/en. When, where and how can I book transport to and from the United Kingdom to France? The best place to check train times and prices from the United Kingdom is http://www.eurostar.com/. This is the official website of eurostar trains. It should be noted that it is cheaper to purchase a return ticket with eurostar than it is to purchase two singles each way, so if you know your return date, it makes sense to book both trains together, to save money. There are numerous direct trains daily from London to Lille and Paris. There are also a number of direct trains each week to Lyon and Marseille, albeit these are of limited use for Ireland’s matches. Similar to Belgium and the Netherlands, a number of buses also operate on the London to Paris route, again including Ouibus. These tickets are likely to be significantly cheaper than eurostar tickets. When, where and how can I book transport from Paris to Bordeaux? The fastest way to travel to Bordeaux, in terms of city centre to city centre time, is by TGV. These tickets can be booked now at SNCF, Captain Train or Loco2 (this last site will charge sterling prices). It should be noted that all TGVs, including the lower priced IDTGV, have lower priced advance tickets, which are limited quota. As such, the earlier you book your train tickets, the lower the price. The cheapest tickets generally start at approximately €25 for individual tickets but cheaper tickets are available for groups. Groups are defined as at least three people. Long distance transport in France was only recently deregulated to allow long distance coach services to compete with the railways. National railway company SNCF have launched coach services since this deregulation, and these are also marketed as Ouibus. These tickets are again likely be significantly cheaper than the TGV but also much more time consuming. Flights are likely to be more expensive than taking the train and are likely to take a longer period of time, city centre to city centre, in particular between Paris and Bordeaux. When can I book transport from Bordeaux to Lille and how much will it cost? There are effectively three options: one of four direct trains each day, train options involving a transfer across Paris, or flights. All train tickets for this route have now gone on sale. These tickets can be booked now at SNCF, Captain Train or Loco2 (this last site will charge sterling prices). As such, they are only likely to get more expensive and should be booked sooner rather than later, via the three usual websites. The direct trains leave Bordeaux at approximately 7am, 9am, 3pm and 5pm. For best views, you should select “upper deck” when booking, as these trains are double deck TGV Duplex trains. With sound barriers along the route, those in bottom deck seats will not see over the barriers. The second option (see below) involves two trains, one from Bordeaux to Paris, and a second from Paris to Lille, along with a metro transfer from Gare de Montparnasse to Gare du Nord. The third option, flying between Bordeaux and Lille, is likely to be the most expensive option, although check, as train tickets will become more expensive closer to the date. So how do I search for options involving a transfer across Paris? When searching for trains involving a change, it may make more to sense to search separately for the trains to and from Paris (i.e. train one from Bordeaux to Paris and train two from Paris to Lille). There is unlikely to be any saving for making one booking directly for both trains, as each is priced individually. The important thing to remember is to leave time to cross Paris; my advice would be to allow at least one hour from Montparnesse to Gare du Nord. My best current advice would be to search first for direct trains, then compare the current price of those to trains via Paris. There is little hassle in getting across Paris (the connection is a 17 minute metro ride direct on line 4, cost €1.80 each, although this is literally only the train journey time, so allow at least an hour to transfer, as walking to the metro station, buying a metro ticket, finding the platform, waiting for the next metro, and getting up from underground at the Gare du Nord will all take time). If the trains you wish to book show up as one booking on the voyages-sncf website, it may be best to book them as one booking there (this is likely to happen if the transfer time is between 50 minutes and 1 hour 20 minutes) rather than separately, as this should ensure less hassle in the event the first train is delayed. However, if the gap is longer, it makes more sense to book as two separate bookings. Certainly, for search purposes, it is easier to see all options if you search the bookings separately. What will I do if my first train to Paris is delayed and I am going to miss my connection? In the event your first train is delayed getting into Paris, you should first seek out the conductor on the train to Paris, as they should be able to help. They should be able to endorse your ticket and ensure that you are able to get on a later train to Lille without extra cost, if the delay in you getting to Gare du Nord is caused by the first train being late. This is still likely to require a visit to the ticket office once off the train, however. If you cannot find the conductor and are going to miss the connecting train, you should still visit the ticket office in either Montparnasse or Gare du Nord, as they should also be able to help you. However, note that simply jumping on the next train to Lille is liable to cause you problems, especially if the first train was not delayed. While some sources suggest SNCF have a “HOTNAT” policy to cover issues like this (“hop on the next available train”) in the event of delays, it may well be the case that any conductor or ticket checker on the train to Lille will be able to check if your first train was late into Paris, and, as such, you probably should not chance your arm. A visit to the ticket office should not take very long and staff are generally able to speak English or at least find a colleague who can translate. If it is possible to rush and make the connection, that is obviously the “first best” option, as it can be remedied in the event you miss a connection, but it is risky (to say the least) getting on a train other than the one you are booked on without first speaking to the ticket office. If nothing else, speaking to the booking office may mean you get a seat reservation, whereas getting on a train to Lille without one could see you standing for an hour. What should I do if I am booking for a group? It should also be noted that “mini group” tickets (for 3 to 6 people) may well offer savings over buying individual tickets and it may help to book tickets like this rather than individually, depending upon how many cheap tickets remain for each train and how many people you have travelling. However, in certain, very limited situations, this may not make sense. If, for instance, only three cheap tickets remain on one train, and you search for tickets for four people, you will only be offered more expensive tickets, not three cheap tickets plus one more expensive ticket (leaving the three cheaper tickets for anyone searching for one to three seats). As such, for trial purposes, it may help to search for one person, then for multiple people, depending on how many cheap tickets remain (if cheap fares are limited, information about how many remain will show on the voyages-sncf website, which will help you search). It could, potentially, be the case that making separate bookings saves money. It should be noted that this is quite unlikely, and is only likely to apply if there are fewer “prems” tickets (those non-exchangeable, non-refundable) remaining than travellers you wish to book for. However, there is little to be lost by searching for this, and seeing how many cheap tickets remain. What personal information do I need for other passengers travelling with me? It should be noted that the SNCF website defaults to e-tickets, which will require knowledge of the name and date of birth of each person travelling, and will require you to print out your own train ticket. If you do not have this information, you can select ticket collection in France, at the station, at no extra charge, or even posting. While ticket collection will require you to have the payment card and the booking reference with you in France, it may be handier than taking time to collect all the relevant d.o.b. information, and potentially missing out on the cheapest remaining fares, especially as it could take a day or two for people to reply with their date of birth etc. While this information is rarely checked (most conductors are happy so long as names match on printed tickets), it could cause some concern. Given that there is no need for the information to finalise a purchase, it may well be best to proceed without it and select an alternative ticket delivery method. If you change the ticket delivery method on the SNCF website, the boxes requiring input of names and dates of birth for passengers will disappear. How can I get from Paris to La Rochelle? Frequent TGVs link Paris and La Rochelle. These trains also have limited quota advance fares and should be booked in advance, as above. Steve Amsterdam and greenforever may also be running buses from Paris to La Rochelle on the 14th June. Please contact them directly on euro2016buses@gmail.com for further information on prices and times. Payment can be made by bank transfer or paypal. Their bus organisational skills are excellent and they come highly recommended, in terms of speed, comfort, facilities, price and craic. How can I get from La Rochelle to Bordeaux and back? Train times from La Rochelle to Bordeaux and back are inconvenient on match day, as are public buses. The trains are significantly slower than the buses being organised by a number of posters on this board. Steve Amsterdam and greenforever are in the process of organising buses and their organisational skills and buses come highly recommended from a number of fans, in terms of speed, comfort, facilities, price and craic. Please contact them directly on euro2016buses@gmail.com for further information on prices and times. Payment can be made by bank transfer or paypal. Do I need to book regional train tickets in advance? In short, no. Almost all regional trains in France are known as “TER” trains (the approximate translation being “regional express train”). These trains have fixed price fares and there are no advance discounts. The trains do not have seat reservations, unlike TGVs, which have mandatory seat reservations. They also offer discounts for the under 26s and pensioners, at off peak trains. These trains run many regional routes in France, including the Bergerac to Bordeaux route, and routes in the North of France between Lens and Lille. However, the tickets can be bought in advance, if desired, at the usual sites, SNCF, Captain Train or Loco2 (this last site will charge sterling prices). These tickets are available nine months in advance and so may be booked now. As noted, however, the only saving is time in the station, as the tickets online are the same price. There are some “Intercites” trains which run on regional routes. These trains are the same price as the TER trains at full fare. However, they also have some very cheap advance purchase fares, available on the same sites. As such, there may be benefit to booking these in advance. How expensive are tickets likely to be? It depends how far in advance you book. Many tickets are on sale already, and in most instances the cheapest advance tickets start for around €19 to €25 for long distance trains. However, if you leave it closer to the time, tickets may be much more expensive and could be over €100 for long distance trains. For long distance TGV, Thalys and Eurostar trains, yes. All major trains have limited quota, advance purchase fares. When the cheapest fares sell out, the next category will then go on sale, and so forth, until the only tickets left are expensive full price tickets. For short distance regional trains, there is no need to book in advance, as tickets will be the same price in the station. Just remember that youths and pensioners get discounts on off peak trains. When should I book my tickets? Sooner rather than later is generally advisable. Tickets for most trains are already on sale, with the exception of some domestic TGVs which will only go sale on March 10th, as advised by SNCF. For international high speed trains (Thalys, TGV and Eurostar), tickets should be booked in advance. It is very rare that tickets will get cheaper as we get closer to the time and it is much more likely they will only get more expensive, barring sales or promotional offers. As such, it is generally advisable to buy tickets as soon as they go on sale, or shortly thereafter. If you want to know when tickets go on sale, it is possible to set up an automated booking alert on SNCF, which will notify you when the tickets you want go on sale. This should ensure access to the cheapest fares. If you search for trains on the date when you want to go and tickets are not available, enter your email address in the box and you will be contacted once tickets go on sale. How much is an interrail pass for France? The price depends on two things: the first is age and the second is the number of days validity. The cheapest pass allows for three days unlimited travel in a one month period for a person under 26. That pass is €154. Prices for adults over 26 are more and are available for periods up to 8 days a month. An adult pass in that category is €313 for eight days in one month. More information on prices is available at http://www.interrail.eu/. Are there any extra charges on top of that? Yes. If you wish to take a TGV in France, you will be required to pay a reservation fee on top. There are a limited number of €9 reservation fees available although the more likely fee is €18 per reservation on long distance, high speed TGV trains. These fares apply per train, so for journeys requiring a change, you may have to pay twice. Is an interrail pass really worth the expense? Chances are, an interrail pass will not be good value. Assuming you fly into Paris for the first game, or are travelling from Amsterdam or the UK (Interrail pass fares on Thalys and Eurostar are more expensive than the cheapest tickets on those trains), you will only need to make two or perhaps three journeys across France: Paris to Bordeaux, Bordeaux to Lille and perhaps one more to an airport in order to fly home. Advance ticket train fares should be significantly less than the cost with a pass. Paris to Bordeaux starts at €19 and Bordeaux to Lille is likely to be available from approximately €25. The reservation fee for interrail pass holders alone are almost that much. The one way they may make sense is if we make it through to the later stages. Walk up fares for long distance trains are quite expensive. If Ireland were due to play a second tie in Lyon, a quarter in Paris, a semi in Marseille and the final in Paris, full price train fares would be quite expensive, having to be bought at short notice. The same is true were Ireland to have to play in Toulouse in the last 16, then Lille, then Lyon, then St Denis. However, for the group stage alone, an interrail pass is very unlikely to make sense. However, if cheap fares are not available when you go to book (for instance, if you left it too late), then an interrail pass may also make sense. It should also be noted that there are cheap fares available on some Paris – Lyon – Marseille line trains at Ouigo.com, albeit these trains do not travel from city centre stations (they travel from the station at Disneyland Paris, and a suburban station in Lyon) and come with budget airline style travel restrictions (30m advance check in periods, print your own boarding pass, limited luggage space). In the event long distance journeys become necessary on that line, Ouigo trains may represent the best option. Interrail passes are unlikely to be a good idea. In the event Ireland play in Lyon in the second round, the cheapest way of travelling down is likely to be getting the Ouigo train from Tourcoing to Lyon. When would I need to buy an interrail pass? You are required to purchase interrail passes in your home country and they can only be posted to such an address. As such, if you book advance train fares for the group stage, but Ireland make it further, it would not then be possible to buy an interrail pass in France to cover the rest of the tournament. It should be bought well in advance of leaving for France. What is the best way from the airports to the centre of Paris? Fast “RER” trains connect Paris with its airports. These also link with the metro which will get you around Paris easily. There is a premium to pay for the airport trains, however, and they are not covered on ordinary tickets. The tram at Orly may not attract a premium, although the RER to CDG does. How do I get to the stadium in Paris? The Stade de France is well connected with numerous stations on both the RER and Metro near the stadium. Which option is best depends on where in Paris you are coming from. A metro map is available here. It is not yet known if the match ticket will include free public transport on the day of the match, although it is anticipated that it may. How much does a metro ticket cost and is there any sort of pass I can buy? The best source of information on Paris transport is the official RATP website, http://ratp.fr/. A single ticket, valid on all forms of transport, costs €1.80. Be sure, however, to validate your ticket after purchase, as otherwise you may be deemed to be travelling without a ticket. 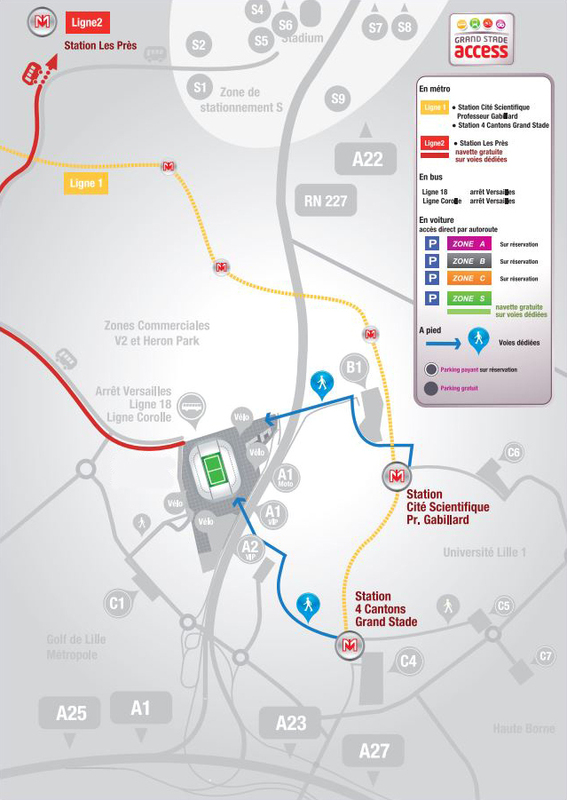 You will likely only require a single “zone 1” ticket for any journeys around Paris, aside from going to and from the game. A book of 10 tickets is only €14.10, a significant saving on buying individual tickets. Especially if you are travelling in a group, this may make much more sense than just buying individual tickets for each trip you make. A two day “Paris Visite” card is €20 and a three day ticket is €27.30. While they have additional benefits, such as museum discounts, and include transport to and from Orly airport (but not CDG), they are unlikely to make sense, compared to buying individual tickets. What sort of public transport is available in Bordeaux? Bordeaux has a tram system that connects the city centre with the stadium and other outlying areas. It is likely to be the easiest way of reaching the stadium on match day. Line C connects the city centre to the stadium, just north of the ring road, via a recently opened extension. Some older maps will not show the full length of this line, or may show it as “under construction”. A map of the system is available here. Again, it is not known if match tickets will include transport on match day, although it may well do so. Further information is available on the website of the local transport authority, at http://www.infotbc.com/en. For further away locations, such as Arcachon, Bergerac and other outlying towns, trains depart from the main station at Gare St Jean. This is also located on line C of the tram. The last train to Bergerac departs at 20:05 on Saturdays and the last train to Arcachon is 22:05. However, this information should be checked directly on SNCF closer to the time to ensure it remains accurate. It is likely that single tickets will make more sense than any sort of travel pass with the possible exception of those who are in Bordeaux for a full week for whom a 7 day pass may make sense. A single trip ticket is €1.50, a book of five is €6.70 and a book of ten is €12.40. A one day pass costs €4.60 and a 7 day pass costs €12.40. What sort of public transport is available in Lille? Lille has a metro system, which is driverless and automated, in addition to buses. The website of the local authority is available at http://uk.transpole.fr/. It is unknown if the metro will run later on matchdays, as it normally finishes at 00:20. This may change. Again, it is not known if this transport will be included free with the match ticket. A single ticket for the metro costs €1.50 and a book of 10 costs €12.50. A day pass costs €4 and a week long pass is €15.20. While the stadium is not directly connected with the metro, there are metro stations close to the stadium, which will take you back into the city centre after the game. A full route map for the Lille area is available here. A more localised map is available here. Line B of the Metro is the best way to the stadium on matchday with the best station likely to be at the end of the line, per this map from the stadium website. What are the best airports to fly to for this game? There are multiple options to price for this game. Obviously direct flights to Paris from Dublin will be expensive. In terms of intermediate destinations, Brussels (Ryanair and Aer Lingus), Amsterdam (Ryanair and Aer Lingus) and London (multiple airlines) are reasonable choices, followed by ground transport from each of those locations onwards, as outlined above. Prices for flights are obviously variable, as are the prices of trains from each of those locations onwards. There are also direct trains to Paris from Cologne (Thalys) and Frankfurt (Deutsche Bahn) taking approximately four hours in both cases. Flights to Cologne are with Germanwings and flights to Frankfurt are with Lufthansa and Aer Lingus. What UK airports might I fly through in order to get the cheapest flights? What other airports could I fly to for the Belgium game? The closest airports to Bordeaux, aside from the main airport, are in Bergerac and La Rochelle. There are frequent trains from both destinations to Bordeaux. From Bergerac, the train takes approximately 1h20m, whereas it takes approximately 2h15m from La Rochelle. To Bergerac from the UK, there are Flybe flights (Birmingham, Exeter, Edinburgh, Manchester, Southampton), Jet2.com (Leeds Bradford), Ryanair (Stansted, Bristol, East Midlands, Liverpool) and BA (London City). La Rochelle has direct flights to the UK with Flybe (Southampton, Birmingham and Manchester), Easyjet (Bristol and Gatwick), and Ryanair (Stansted and East Midlands). There are also direct flights from Dublin to La Rochelle. Biarritz and Toulouse may also suit. Toulouse is approximately two hours away by train or three hours by Ouibus. The bus starts at €9 and the train at €15. The train tickets are not on sale yet although the bus is. Jet2.com fly to Toulouse from a number of airports in the UK, namely Edinburgh, Leeds and Manchester, although some of these flights may be winter seasonal flights. Easyjet from from Gatwick. Easyjet also fly from Toulouse to Lille, which may be convenient for getting between the two games in Bordeaux and Lille. From Biarritz, the train is €33.80 and also takes about two hours, although there may also be cheaper tickets for the TGV available in advance. Flybe also fly to Biarritz from Birmingham and Southampton and Ryanair fly from Stansted. Poitiers and Brive-la-Gaillard may also be options. Where can I fly to for the game in Lille? From Charleroi, it will take approximately 1h40m on local trains. Trains are hourly, €23.40, take 1h40m, and require one change, in Tournai, with seven minutes to change. From Brussels to Lille, the Ouibus referred to above may be a good option, as it is less than two hours (although only 30 minutes on the fastest trains). There are multiple slower train options taking approximately 2 hours, costing €23.40, generally with one change. The faster trains are generally priced around €30. Aside from special Euro 2016 flights being put on by Ryanair to Dublin, there are no general services from Lille to either the UK or Ireland. The cheapest way home is likely to be overland. There are very cheap buses with Ouibus from Lille to London, in the region of €25, which may well be available even immediately our game in Lille. From London, sail rail tickets to Dublin are available for less than £50 at any stage. In the event we are knocked out after the group stage or after a last 16 game in Lens, the bus option via London may represent a very cheap way of getting home, for those who do not wish to pay expensive, last minute flight prices. There is also a special TGV from Lille to Paris after the game against Italy, which may be of assistance. It leaves after midnight (00:15) and can be found by searching for trains travelling on the 23rd June, not the 22nd. Tickets should be relatively cheap. They are currently (1st April, 2016) available for €20, although check this has not changed. How much are road tolls in France? Road tolls in France are significantly more expensive than they are in Ireland or the UK. They are generally based upon distance travelled; the longer you travel, the more they are. How can I calculate how much the road tolls are? Can I avoid road tolls? The vast majority of motorways in France have road tolls. However, national roads do not have tolls, and may save you on tolls, particularly between Poitiers and Bordeaux. This map:http://about-france.com/photos/maps/france-motorway-map.jpg from an unofficial source shows a rough outline of toll roads in red, national roads in green and free motorways in blue. I cannot attest for its accuracy but I have no reason to doubt it either, although it may not be 100% up to date. Disclaimer: all this information is, to the best of my knowledge, up to date as of 1st April, 2016, but may change, and no liability is accepted for any inaccuracy. Train prices, in particular, may fluctuate. Also, you may use this information as freely as you want but if you intend to publish it elsewhere, please contact me first. In particular, if you wish to publish this information in any form that may be exchanged for payment (e.g., in a guide book for fans) or similar publication that is not free for users, or for which any payment is received by the publisher (e.g. if you publish a free guide but where publication is paid for by a sponsor), you are requested to contact me beforehand. A lot of time and effort has gone into creating this as a free resource for supporters and anyone publishing it for their own gain or the gain of others is requested to contact me for authorisation if they wish to use it, and I will deal with such requests on a case by case basis.